Meeting the life insurance needs of the senior market since 1939. More than 10,000 Americans turn 65 every day. That’s more than 3 ½ million each year. The sky is the limit when you become an agent for Old American Insurance Company. Old American is one of the nation’s premier final expense insurance companies. We’ve recognized the distinct needs of the senior market since our inception in 1939, and have designed our marketing efforts to respond to those needs. A career with Old American is a career of unlimited opportunity, with no upfront investment and the potential to earn as much as you want. Because of our market knowledge, we offer something unique in this industry – a sophisticated and proven prospecting system. You can be assured that each and every day you will have a prospect to visit who has already expressed an interest in our products. With our proven product portfolio you can deliver the protection, benefits and guarantees seniors are looking for. We continue to develop the products and services you need to stay in front of your clients and satisfy their changing needs – just like we have been doing since 1939. The Old American opportunity gives you time to focus on building outstanding relationships with your clients. 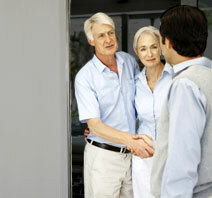 The trust your clients place in you and Old American is critical to your success. With Old American at your side, you’ll gain a leadership edge and quickly distinguish yourself as a true professional dedicated to your career and your clients. Old American rewards your growth and independence while building on your strengths to fulfill your personal goals. Increasingly, high performers seeking a superior career in the senior market are joining Old American. If you’re looking for a company that provides you with unlimited opportunities, contact our recruitment hotline at 1-800-609-4439. As an Old American agent, you’ll become part of a family that has built its reputation on knowledge, trust and integrity in helping people.